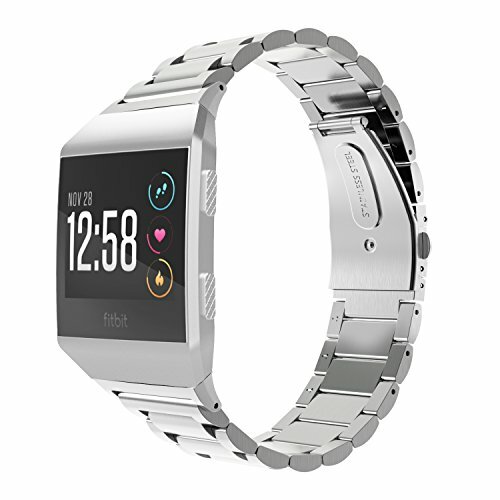 Custom designed for your precious Fitbit Ionic Smart Fitness Tracker, this MoKo Premium Solid Stainless Steel Metal Replacement watch Band features a combination of functionality and style. * Personalized your Fitbit Ionic Smart Fitness Watch with this refined replacement stainless steel wrist band. * Band comes with Fitbit Ionic Smart Watch Connectors on both ends, which locks onto Fitbit Ionic Watch Band Interface precisely and securely. Easy and direct installation and removal. * Adopt unique triple safety folding clasp, firmly closed, and prevent loosen automatically, easily to take on / remove, safe and beautiful. * High-tech surface finish watch strap fits your device and feels comfortable on your wrist. * Equipped considerate items with a set of withdrawal tool for length adjustment. Personalized your precious Fitbit Ionic Smart Watch with this refined replacement stainless steel wrist band. Watch NOT included. Band comes with Fitbit Ionic Smart Watch Connectors on both ends, which locks onto Fitbit Ionic Watch Band Interface precisely and securely. Easy and direct installation and removal. Adopt unique triple safety folding clasp, firmly closed, and prevent loosen automatically, easily to take on / remove, safe and beautiful. Fits 5.31"-8.07"(135mm-205mm) wrist. Equipped considerate items with a set of withdrawal tool for length adjustment.